Occasionally you read a book and think 'I wish I'd thought of that.' 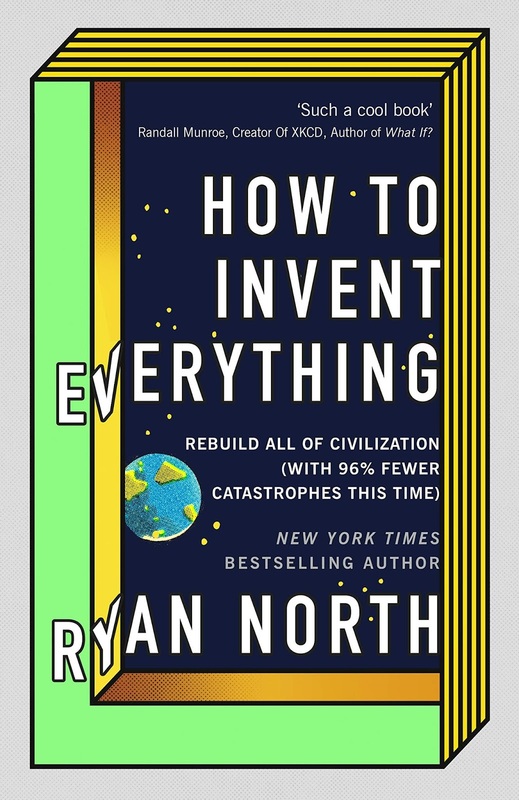 This was my immediate reaction to Ryan North's How to Invent Everything. The central conceit manages to be both funny and inspiring as a framework for writing an 'everything you ever wanted to know about everything (and particularly science)' book. 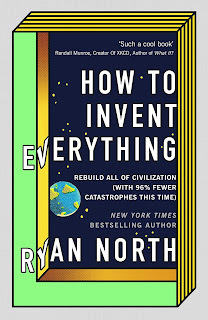 What How to Invent Everything claims to be is a manual for users of a time machine (from some point in the future). Specifically it's a manual for dealing with the situation of the time machine going wrong and stranding the user in the past. At first it appears that it's going to tell you how to fix the broken time machine - but then admits this is impossible. Since you're stuck in the past, you might as well make the best of your surroundings, so the aim of the rest of the book is to give you the knowledge you need to build your own civilisation from scratch. We start with a fun flow chart for working out just how far back in time you are stuck (and what you will be faced with as challenges). From then on, there's a mix of practical information and background of theory that might help you rebuild some kind of civilised world. So we get science, technology, the arts, medicine - inevitably cherry picking but sometimes in a surprising amount of detail when focussed on a small part of what's needed. In some ways, what we have here is a modern version of those popular books from a good few years ago that told you how to survive crocodile attacks and the like, but on steroids. Not only is this book far fatter (we're talking over 450 pages) it takes the premise of providing mostly accurate but practically useless how-to information to the wonderful extreme. Since the reader isn't actually stranded in the past, it's not going to be a truly practical guide, but it does put across a surprising amount of information in an approachable manner. It's like having the old Pear's Cylopedia crossed with a science fiction comedy. My other slight moan is that the big sections on growing food and 'common human complaints that can be solved by technology' got a little samey and were distinctly over-long. Some aspects of establishing the needs of basic civilisation are... rather dull. But there was still much to delight in as the book skips its merry way from units of measurement to how to invent music (with a few classical pieces included to claim that you composed, because who's going to know you haven't). The reality, then, doesn't quite live up to the brilliance of the idea. I'm not sure anything could. But it still remains a great way to link together a portmanteau of any random bits of knowledge that North felt it would be enjoyable to impart. It would make a great gift book and will give a lot of pleasure. You may even learn something handy, should you ever be stuck in the remote past.